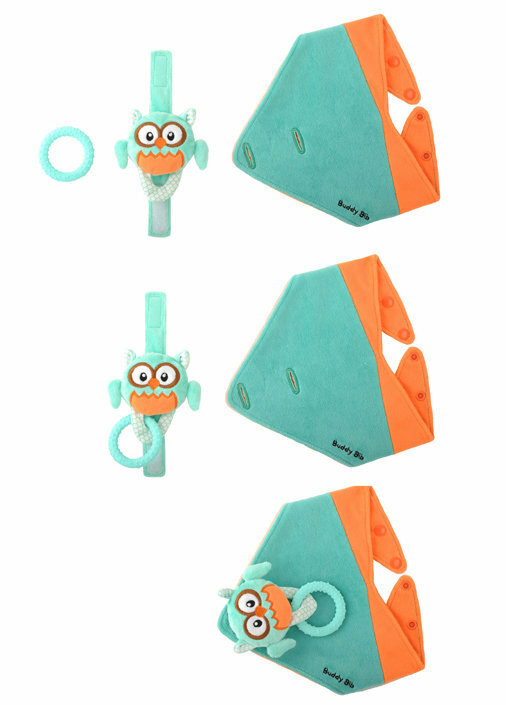 The Buddy Bib is our NEW 3-in-1 Sensory Teething Toy & Bib. 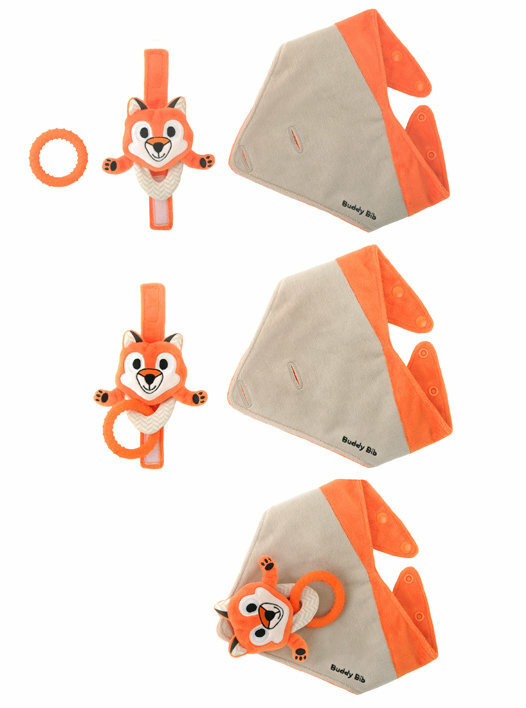 Includes: Plush wearable toy, bib and a flexible 100% food-grade silicone, BPA free Teething Ring (soother is not included). 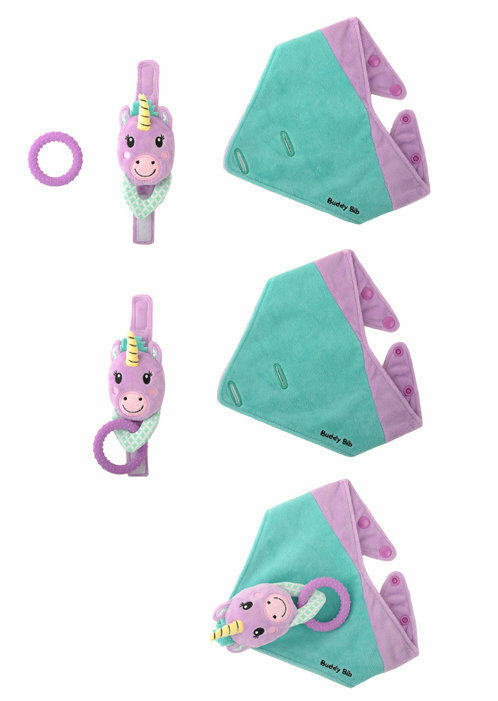 The removable and wearable plush sensory toy holds baby's soother (any with handle) or teether. 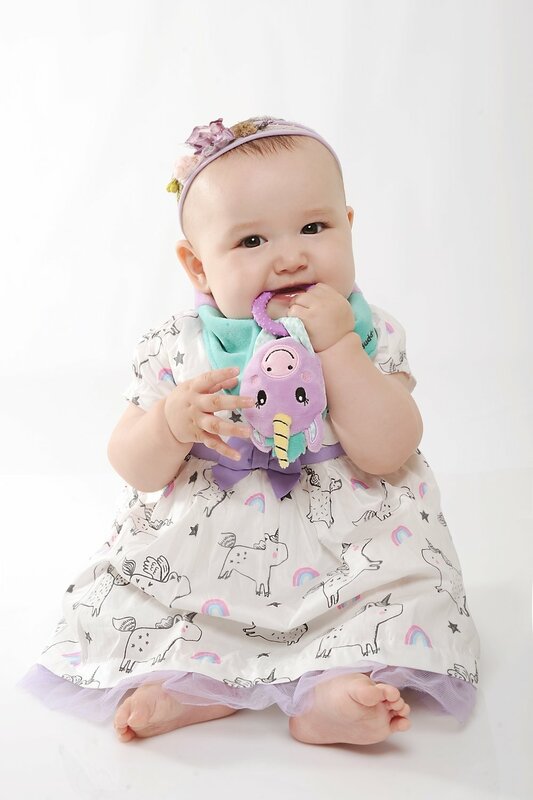 Provides baby convenient access to their soother or teether, while having fun interacting with their soft, cuddly, buddy. 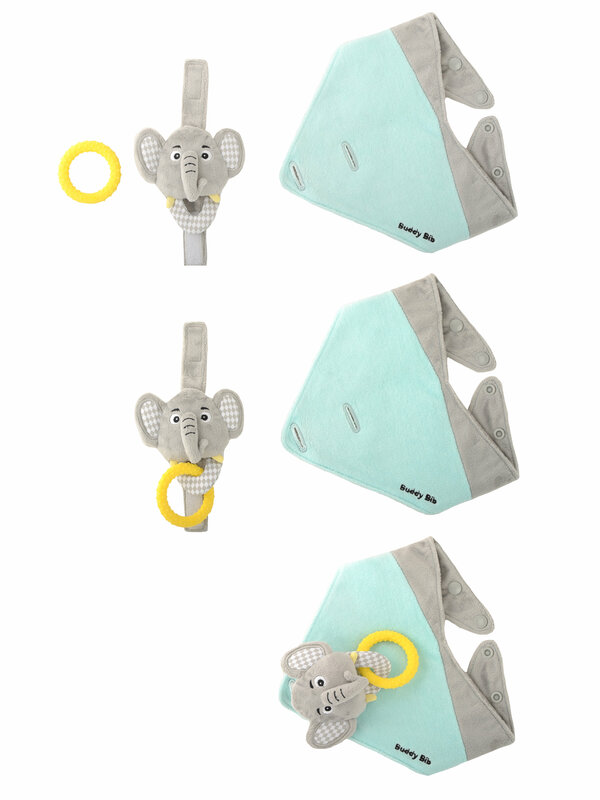 Soother/teether holding buddy can be removed and used separately from bib (affixed to stroller, car seat strap or wrist etc.). 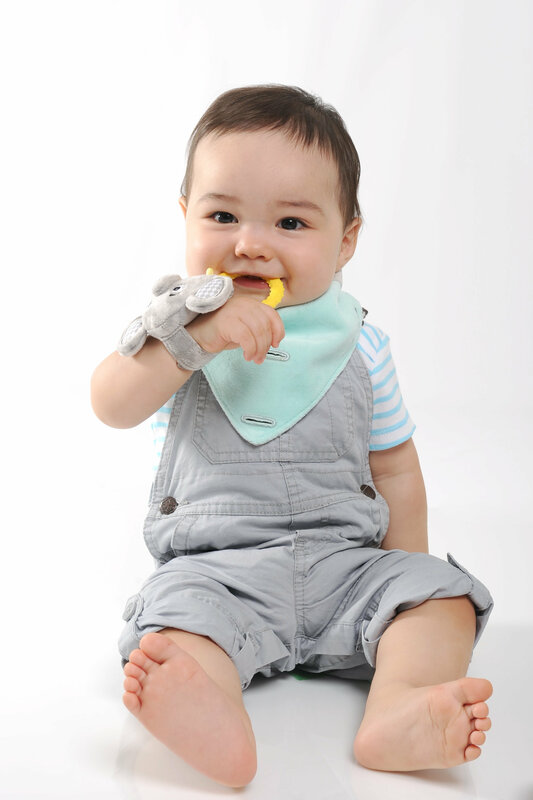 Soft fabric bib with water resistant layer contains drool and keeps clothes dry and is reversible. Suggested age range is 6-18 months. 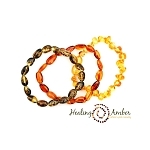 Keeps baby's soother or teether in a safe, accessible place and prevents from falling out of the mouth onto the floor. Safety tested to exceed all federal safety requirements, including CPSC, ATSM regulations and the most current CPSIA. 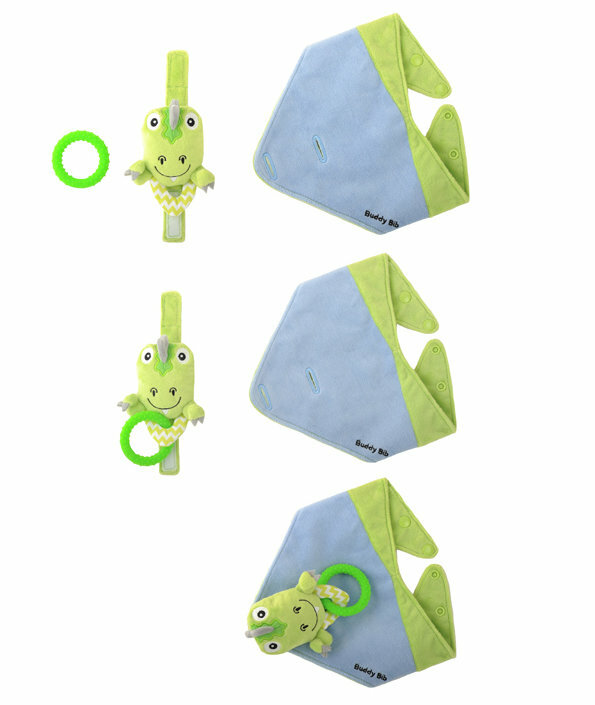 For intended/best use - Plush buddy should be affixed to bib upside down (so that is it facing baby when worn). This way he/she can interact with the plush buddy and have easiest access to their soother/teether. Wash regularly to remove saliva or food residue from fabric. Remove (or leave attached) plush toy. Machine wash with babies other fabric items. Machine dry on very low/no heat fluff or delicate cycle. Do not dry on hot heat or over dry. If toy or bib becomes damaged please discontinue use and discard. Do not sterilise bib or buddy in microwave. Silicone teether should be hand washed. Do not store any fabric items that are damp/wet with saliva or water in an air tight place.